Hello there I'm Aldo and I'm the guitarist from the band Man Shaped Wolf. We've been going for about 2 years strong and have about 2 albums worth of original material. We gig regularly (about once or twice a month) and our live shows have been gaining more and more interest. Over time we've gone up and up in the billing and now get regular headline slots at various top London venues. We are ready to take the plunge and look into management and touring but unfortunately our drummer is not ready to make that commitment. There are no hard feelings between us but it does mean we need a new drummer. We're all around mid 20s so if you're around that would be best. 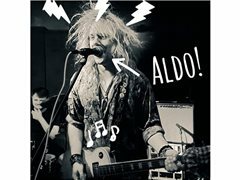 We've just released our debut EP on our new website so take a look and have a listen and get in touch with me if you dig it. Our website is manshapedwolf and the same for our Instagram and SoundCloud and twitter if you wanna have a look.